WASHINGTON (BRAIN) — Kent International and Detroit Bikes have withdrawn a petition to the U.S. International Trade Commission that sought protection from complete bike imports in the form of new tariffs of up to 50 percent. The Section 201 duties would apply to imports from all countries, and are intended to encourage U.S. bike assembly. 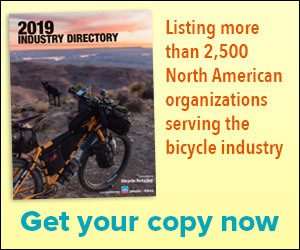 WASHINGTON (BRAIN) — Two domestic bike assemblers are asking the International Trade Commission to look into imposing tariffs of up to 50 percent on imported bikes. WASHINGTON (BRAIN) — President Donald Trump has ordered the State Department to begin renegotiating the Universal Postal Union treaty, which allows China and other developing countries to ship products to the U.S. at very low rates. BRUSSELS (BRAIN) — The European Bicycle Manufacturers' Association has withdrawn its request to the European Commission to begin registering the imports of e-bikes into the EU. MARINA, Calif. (BRAIN) — Daniel Emerson's heart sank when he saw that bike lights were exempt from the new tariffs that took effect today, while light components get slapped with the tariff. "Basically the U.S. government is providing a huge boost to our China-based competition. ... They are telling us very clearly we are not welcome in the U.S.," he told BRAIN on Monday. RENO, Nev. (BRAIN) — In light of the new 25 percent tariffs approved by President Donald Trump this week, bike industry groups are ramping up their lobbying calling for a reform of the de minimis value — the minimum value of an imported shipment that is subject to U.S.
RENO, Nev. (BRAIN) — With a 10 percent tariff hitting bikes next Monday, and an additional 15 percent being added Jan. 1, should retailers dig deep and order all the bikes they can before the end of the year? The tariffs will start at 10 percent and affect most bike goods from China — but not helmets or lights. On Jan. 1, they will increase to 25 percent. RENO, Nev. (BRAIN) — President Donald Trump on Monday said he had approved tariffs on roughly $200 billion of imports from China, including about $1 billion in bicycle products. FOUNTAIN VALLEY, Calif. (BRAIN) — In May, more than a month before the Trump administration proposed a 25 percent tariff on China-made e-bikes, Pedego co-founder and CEO Don DiCostanzo went to Vietnam to look for factories to make e-bikes. The BRAIN staff asked executives at Huffy, Jamis, QBP, Light & Motion, and WTB how they are dealing with current and proposed tariffs. BOULDER, Colo. (BRAIN) — The four-session Supplier Seminar Series presented by the Bicycle Product Suppliers Association at Interbike features a new focus on three industry hot-button issues: the 25 percent additional tariffs on Chinese-made bikes and bike-related products, the U.S.
WASHINGTON (BRAIN) — The public comment period ended Thursday for a proposed 25 percent tariff on $200 billion in Chinese imports, including most categories of bicycle products. Now the industry can do little but wait for the Trump administration to announce whether it will go ahead on the package. Meanwhile, the president has proposed another round of tariffs that would hit virtually every product coming from China.